No more compromises. Enjoy home cooking in the great outdoors. This ingeniously designed appliance combines two versatile and powerful burners with a portable convenient oven, large enough to fit a whole Pizza. Enjoy the convenience of cooking and baking simultaneously at the camp site. The Camp Stove Oven enables you to prepare all the family favourites at your home away from home. 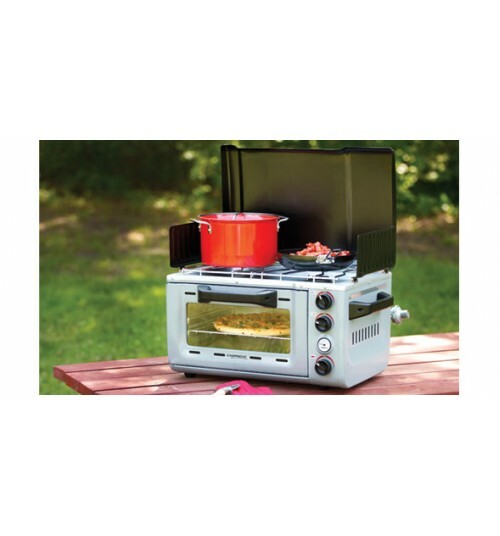 Versatile 2 burner stove and portable, convenient full size oven combined in one appliance. Cook and bake at the same time in the outdoors.